Service Alberta no longer mails out reminders to Albertans letting them know to renew their driver’s licenses. Your driver’s license will always expire on your birthday (not on the last day of your birthday month) and the usual term is 5 years. We recommend that you sign up for a free e-reminder to receive a text or email before your expiry date. You are allowed to renew your license up to one year before the expiry date. If your license expired less than 6 months ago, you are able to renew it in the same way that you would renew a license that has yet to expire. Just bring your license in. We will verify your identity and make any required changes to address, weight, etc. Remember that with all driver’s license services, we do need to shred your license and you will leave with an interim paper license which cannot be used as photo ID. Unfortunately, there is no rush service available. We will give you a photocopy of your license if you ask us, but this is not generally valid as ID. Your new card will arrive in the mail in approximately two weeks. The cost is $84.45 for a five year period. If your license expired more than 6 months ago, you will need to show us proof of legal entitlement to be and remain in Canada as well as proof of Alberta residency. We are required to do this by the Government of Alberta, even for clients who have lived in Alberta since birth. Please see the chart below for examples of documents which satisfy this requirement. Please note that we CAN use your expired license as proof of identification as we will also use your knowledge verification and the photo on the motor vehicle database to verify your identity. If your license expired 3 years ago or more, you will need to start over. 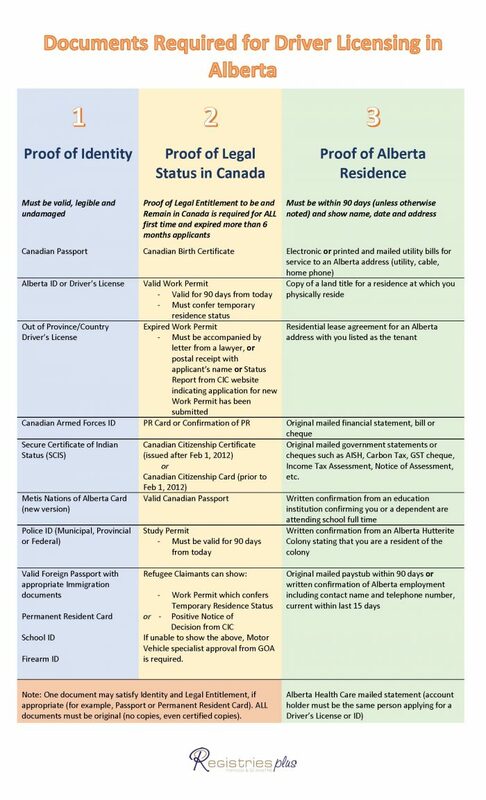 As above, please bring in government-issued photo ID, proof of legal entitlement to be and remain in Canada and proof of Alberta residency. The first step will be a Knowledge Test. Be sure to study for this test. It will cost you $17.60 for each attempt. Once you pass, you will be required to go for a Class 5 Basic Road Test which will cost $89.25. If you pass the road test, you will be reinstated with either a Class 5 GDL or Class 5 non-GDL license, depending upon what you had before. If you have a professional class license which expired 3 years ago or more, please come in to see us so we can pull up your file and let you know exactly what testing you will need to do in order to get a new driver’s license. Due to privacy laws, we cannot look at your file if you are not in our office. Questions? Call us at 403 272-5513. We are here to help!